On this awesome day, the Almighty King judges all of mankind. Every human being stands in judgement, as his good deeds and his misdeeds are reviewed. 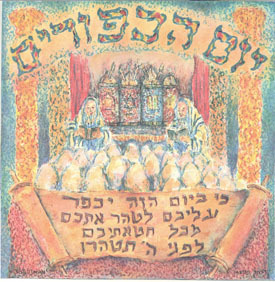 Much preparation is done by us, beginning with the annulment of vows forty days earlier, and with our reciting of the Selihot during the entire month of Elul. Each person must make peace with his fellow man, to forgive, in order that the Almighty will forgive us. The composition of the special prayers, the inspiring poetry, and the moving melodies make all hearts turn away from their perverse ways and brings them to the righteous path. The Great Judge is most anxious to be merciful to us and forgive us of our short-comings when we truly repent. For God wants every person to live. to resolve not to repeat that sin again. After twenty five hours of fasting, prayers, penitence and soul searching, we experience the moving recitation of "EL NORA ALILA", the God of Awe, an entreaty for pardon by the eleventh century Sephardic poet, Moses Ib'n Ezra. We feel as angels before God as we proclaim seven times "The Lord is God" while bidding farewell to the Shechinah (the Holy Presence) as it ascends above the seven firmaments. We stand in rapture before the Holy Ark spiritually reinvigorated for the year ahead, with our souls refined and purified. We go home to break our fast confident that God has accepted our prayers and our Teshubah, and will inscribe us in the "Book of Life" for the year to come. Image of High Holiday Hazzanut Prayer Selections from Sassoon Manuscript #647, Aleppo, circa 1850. 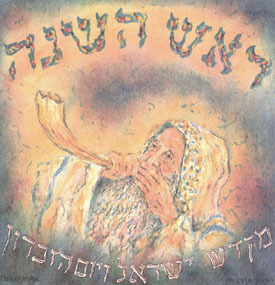 2125 ה' בקול שופר Before blowing the shofar on Rosh Hashana. 2126 שפל רוח Yehuda HaLevi The following is a Reshut for Nishmat. Spain. Apparently this Reshut has fallen out of use in the Syrian community. Pizmonim for Rosh Hashana according to Sassoon Manuscript #647, Aleppo, circa 1850.